This will probably end up being the unit that I use in my Jeep. On my last venture to MicroCenters I was able to pick up a few of the "four button touch" pads. I had some serious difficulties getting it all to work code-wise though. Python code worked every time, however the service failed each time. I put in a 1 second delay which it seems to like better, but yet another second added to boot/ready. Being limited to only 4 buttons however caused another problem. Not enough buttons for reboot and shutdown of the unit. I added code for a combo-button press which got me over that hurdle. Buttons 1-4 control relays 1-4.. nice. 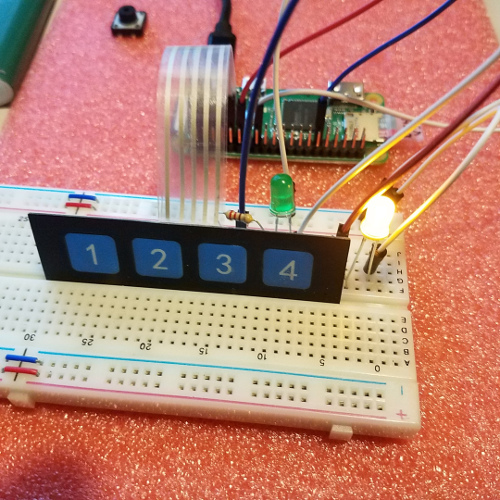 I also added an LED (yellow) to display "blue tooth connected" and another LED (green) to display "some light is on". For combination buttons, if you press two buttons within 1 second (hopefully not accidentally) it will evaluate them as a command. 1 & 3 = reboot the button controller. 1 & 4 = shut down the button controller. 2 & 3 = Sends reboot command to the relay controller. 2 & 4 = Sends shut down to the relay controller. The image above includes the breadboard connections. Once assembled, the LEDs will be direct soldered to the resistor with a GPIO plug on the positive side of the LED. The negative side of both LEDs will be tied to a common ground GPIO connector. This should keep the unit quite minimal in size. The 4 button pad will be mounted length-wise with the pi zero, it is almost the exact length/width dimension-wise as the pi with the GPIO header. Direct solder minus the header is an option but this way seems much easier and I would still need pins for the pad ribbon cable. A backup of the micro SDC and this one is finished and ready for use.